Raffles Phnom Penh, properly known as Raffles Le Royal. Another international standard luxury hotel from the Raffles chain which has cemented its reputation as one of the leaders in the region. The hotel is located just off the Monivong Boulevard near Sangkat Wat Phnom in the center of Phnom Penh, 20 minutes from the airport.. 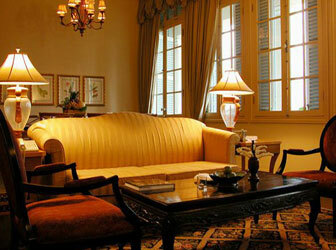 The hotel has a total of 170 rooms and suites. The best room available is the Royal Suite which is located on the 4th floor of the building with a view over the pool, intertwining French and Khmer styles throughout both in terms of the architecture and the furnishings. We use the Landmark suites as standard. The hotel has no less than 5 restaurants and bars, all with their own unique style. Gardens designed by international architects, a divine spa and massage center, and an airport limousine service. Raffles prides itself on offering service to the highest standard. We've found their attention to detail to be second to none, whatever setting or meeting you require for a function or personal meeting, the hotel will inevitably deliver. "Walking into the lobby of Raffles, felt like stepping back into a beautiful timeless world where beauty and archiitecture become the back drop, the friendly staff are like 'old world' actors and the history of the place , is the movie theme. The hotel has been upgraded to 5 star and we couldn't have been more comfortable. Phnom Penh has also been through an upgrade and the city is looking more pretty and clean than it did 2 years ago. One can't help respect a place that still has love and respect for their new King and still embrace their old values from yesteryear. I highly recommend the colonial themed bar on the ground floor." Amanjaya Pancam hotel as an alternative, or the soon-to-be-open Sofitel.